This post was done in partnership with The Capital Grille, who provided me with food and drinks, free of charge. I was not monetarily compensated for writing this Houston restaurant review. All opinions are completely, 100% my own! Of course you would. I know you too well. Last year I had such a great experience sampling The Capital Grille's Generous Pour menu, that when I was invited to try it this year, I jumped at the opportunity! 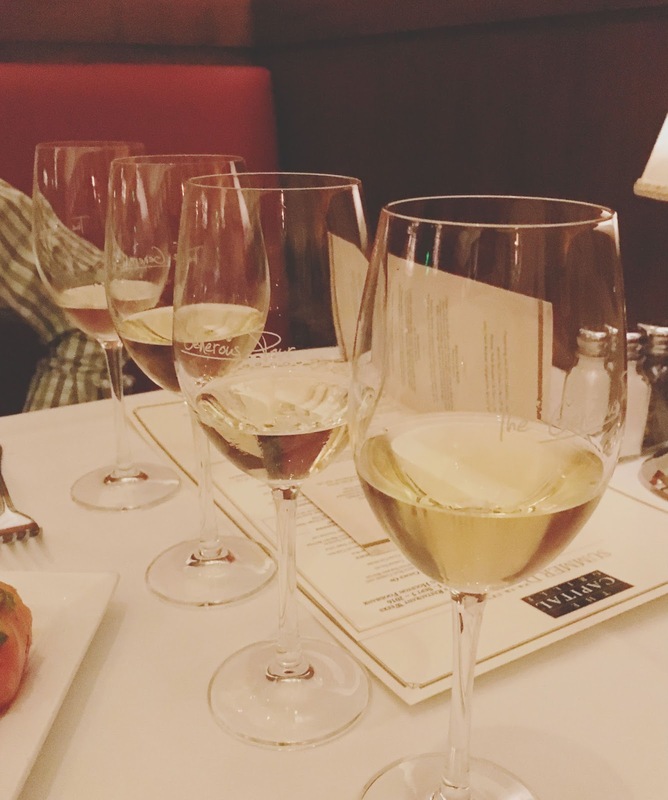 Jon came along for the ride, and we sampled seven different wonderful wines paired with food at the restaurant's Houston City Centre location. The theme of this year's event is "Rebels, Rule Breakers & Game Changers." For $28 per person with dinner, guests are invited to explore seven remarkable wines and enjoy as many as they like. This is an incredibly good value because some of the wines offered cost almost as much, just for a glass! The first glass of wine we were presented with was the Stellina di Notte Pinot Grigio, which comes from the foothills of the Italian Alps (home of the world's most famous Pinot Grigio) and "is the result of a unique partnership of American innovation and traditional wine making." For our food pairing, Jon received prosciutto-wrapped mozzarella with vine ripe tomatoes, and I had the restaurant's fresh mozzarella, tomato, and basil salad, with 15-year aged balsamic. The wine itself - which had a hint of chardonnay - was lemony, oaky, and light. I was a big fan of this wine, and it was one of Jon's favorites. 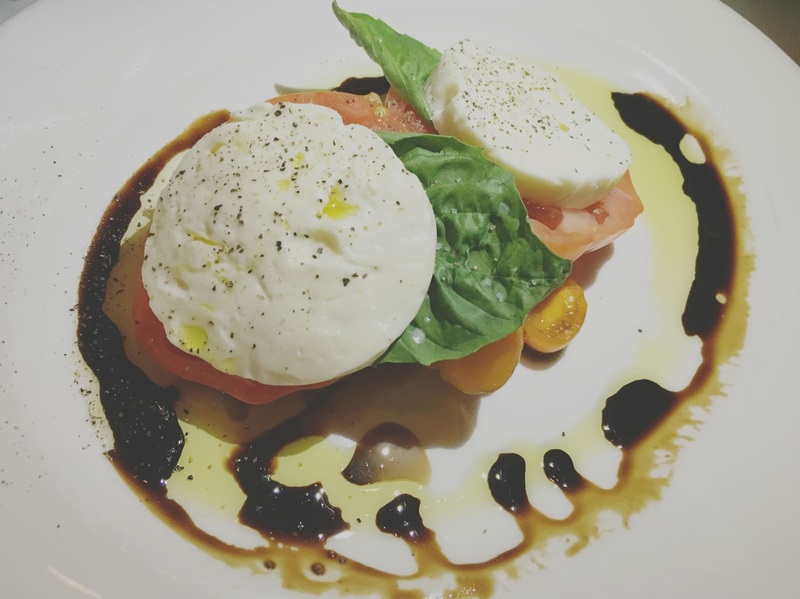 Regarding the food, my caprese was absolutely lovely. The hunk of mozzarella was super fresh, the variety of tomatoes was flavorful and welcoming, and I was delighted that they didn't skimp on oil and vinegar. The balsamic was syrupy and exquisite. I was a fan of the restaurant's caprese last year, and I am happy to report that I am still a fan! Next up, we were poured a glass of Provenance Sauvignon Blanc. The folks who make this wine took a gamble on it because they grow it in Rutherford, California - an area that is traditionally known for its reds. For our food paring, Jon received a lobster and crab cake, and I was presented with roasted whole tomatoes stuffed with mushroom, asparagus, parsley, balsamic vinegar, and Parmesan. Sauvignon Blanc is usually low on my list of whites to buy. However, I was able to sip and enjoy the nuances in this one. Hints of citrus, grapefruit, and grass made this an intricate and interesting pour. 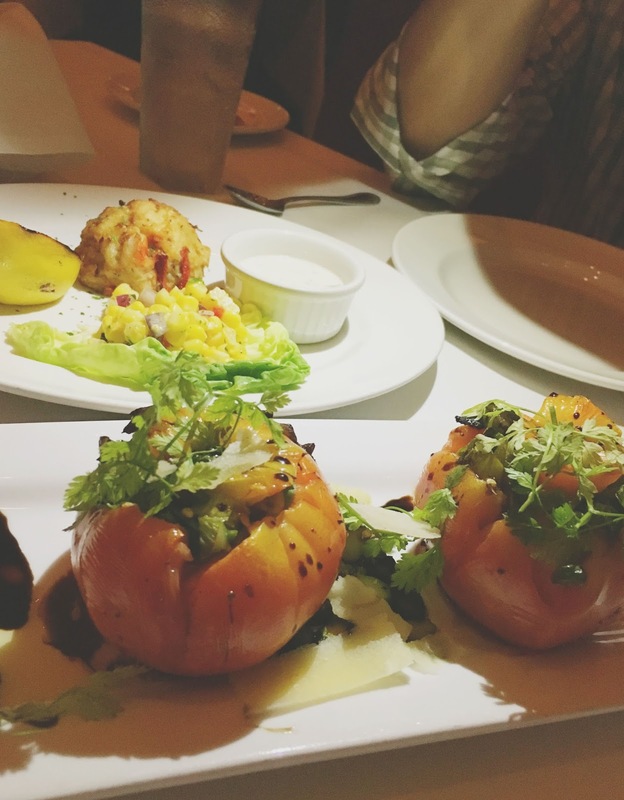 While I also generally don't go nuts over roasted tomatoes, I did enjoy them, especially the filling inside. My absolute favorite part was the freshly grated slabs of oozy Parmesan cheese. The different earthy flavors and textures made this a unique and yummy appetizer! We were then given a pour of the Chateau St. Jean, Robert Young Single Vineyard Chardonnay, which was a welcoming glass for me! This wine was produced from a single vineyard in 1975, which - for a chardonnay - was unheard of. Chardonnay is easily my favorite white varietal, and this one was no exception. Creamy, velvety, full, buttery, and oaky, I felt that it counteracted the citrus in my roasted tomatoes beautifully. It was by far my favorite pour of the evening! For our next glass of wine, Jon and I were given a pour of the Lyric by Etude Pinot Noir. In 1982, its wine makers were determined to grow one of the world's most "unforgiving" grapes, and they definitely succeeded! For our food pairing, Jon's main course was the seared citrus glazed salmon with marcona almonds and brown butter, while I was given a plate of lasagna with roasted vegetables. The wine was woodsy, spicy, and had a fuller body than your average Pinot Noir. I THOROUGHLY enjoyed it. 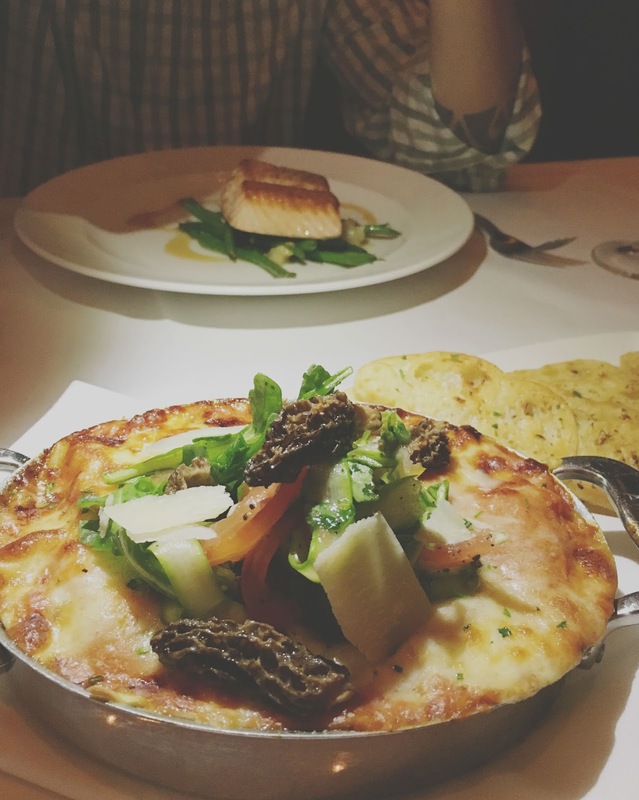 Jon adored his salmon, and I went crazy over my lasagna! The roasted vegetables inside included red peppers, asparagus, and mushrooms (shiitake and oyster), and the whole thing was topped off with a fresh salad. The cheese was bubbling, oozy, and crispy on top, and the vibrant flavors of everything were gasp-inducing. This was a really really REALLY exceptional lasagna! 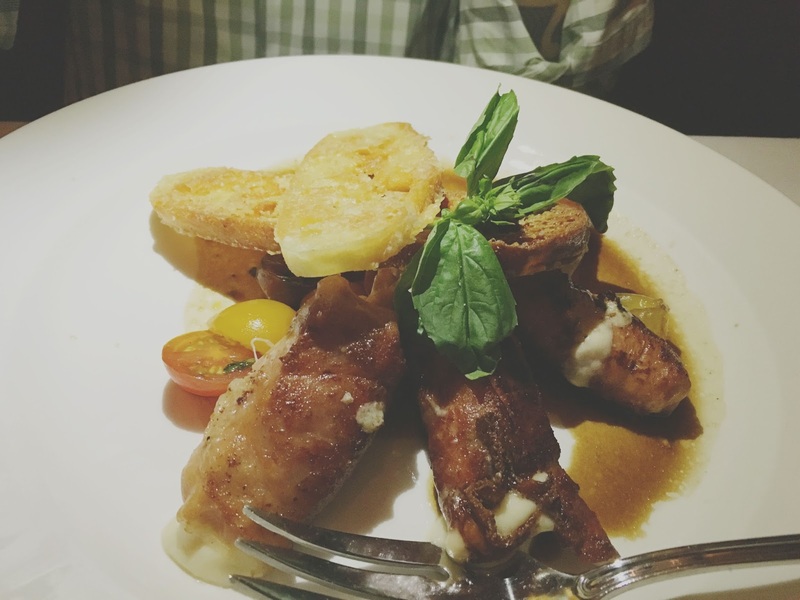 We sampled the final three wines alongside our main course of food as well. The Penfolds Bin 2 Shiraz was a game-changer in that it ultimately altered the landscape of Australian wine when it was created in 1951. This wine was suuuuuper dry, and as such was probably my least favorite of all of them. Jammy, with flavors of stone fruits, I definitely could taste how special this wine was, but I was definitely puckering with each sip! I'll say it - I'm a ninny when it comes to super dry wines. The Beaulieu Vineyard Tapestry Cabernet Blend was first created in 1938 using French oak barrels. This resulted in California's first "cult" cabernet. Though not as dry as the shiraz, this was also a very dry wine. It had perfume-y, piney aromas and had me puckering once again! (For the record, Jon enjoyed this wine, as well as the shiraz. He can stomach dry wines better than I can). For our final pour, we tried the Stag's Leap "The Leap" Cabernet Sauvignon. This winery is so bold that it named an entire growing region after itself! Being a cab, this was also a dry wine; however, it was one I could take on. It was smooth and full, and my second favorite of the reds (first being the Lyric Etude Pinot Noir). This one is also an insanely good value as part of the restaurant's Generous Pour event, because on the restaurant's regular menu it goes for almost $30 a glass! Even though we were stuffed on fabulous food and wine, Jon and I decided to go for the gold and order more food - dessert! 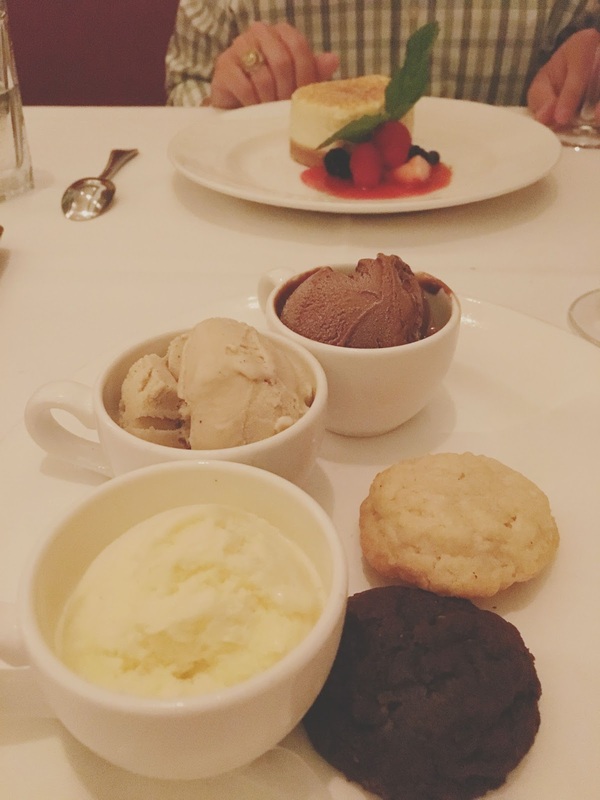 He ordered the cheesecake, and I went with the cookies and ice cream (maybe gelato? I don't know, I blacked out). I had tried their cheesecake the previous year, and it was just as creamy, crumbly, buttery, and delicious as before! For my scoops of ice cream, I selected vanilla, hazlenut, and chocolate. They were accompanied by a chocolate cookie and a vanilla/coconut-esque style cookie. Each element was lovely on it's own, and even more wonderful when paired with another. My favorite choose-your-own-adventure-party-in-my-mouth option was the vanilla coconut cookie combined with the chocolate ice cream. Heaven! 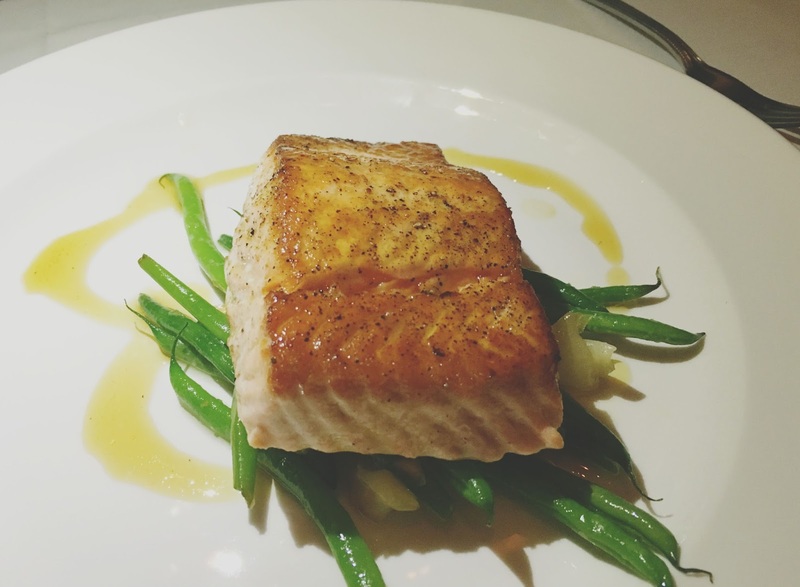 Once again I was completely blown away by my experience at The Capital Grille in Houston's City Centre area. The service at the restaurant was well beyond exceptional; the food was intricate, thoughtful, and outstanding; and the wine on The Generous Pour menu was interesting, varied, and delicious! It is also worth noting that neither my roasted tomato appetizer or lasagna were on the restaurant's menu-The Capital Grille is incredibly accommodating to all different kinds of diets and willing to work with its diners to create meals in line with their food preferences. 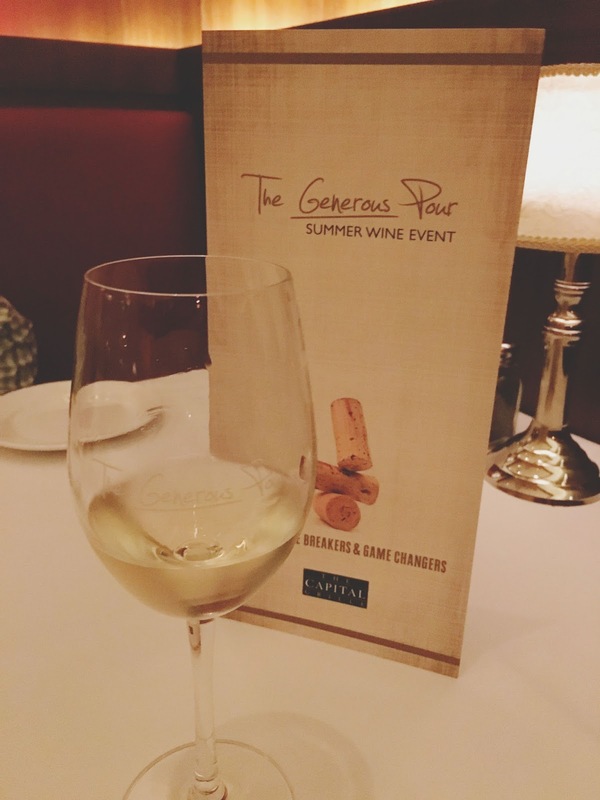 And just like last year, The Capital Grille is also participating in Houston Restaurant Weeks, so if you pair that with the Generous Pour, you're going to have a fantastic evening of food and drinks at a fine dining restaurant for quite the bargain! "yes –unlimited pours to be enjoyed responsibly :)"